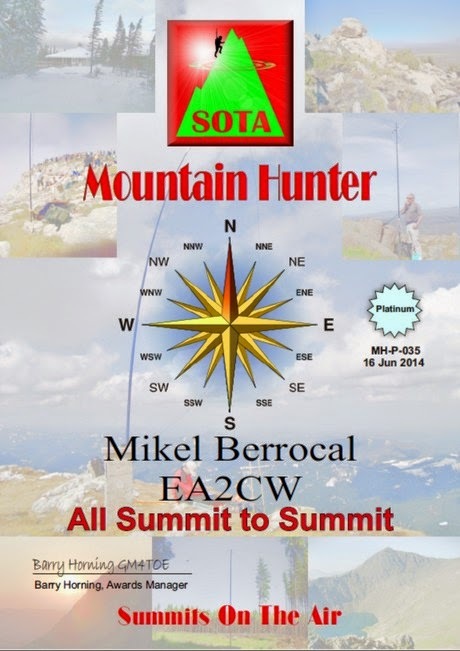 Just yesterday I received from Barry GM4TOE the SOTA certificate Mountain Hunter Platinum level, which means having made contacts with activators on 20 different associations (2 qsos on each one) and at least on 3 different continents. The best of this is that I made all of them while being activating summits, so they are all summit to summit (S2S for short) QSOs. These S2S qsos are not easy, as both stations are usually on QRP and in tough conditions. Even more, when these qsos are made between different continents. In my case, the most of the associations came from Europe, CT3 and EA8 qualifying Africa and VK5 in OC as for the 3rd continent needed. So, first of all, I wish to thank to all the activators who made it possible with their efforts. Specially to the VK activator Ian VK5CZ, as he must stay on the summits late on the evening waiting for our dawn here on Europe to make the QSOs. I'm very proud of this achievement, and it gives me strength to follow the path to the real big one, the Mountain Goat... I have already a long way to reach it.